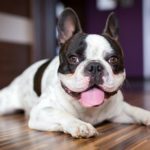 Dog hair can easily coat your clothing, floors and furniture. Cleaning that hair up can be frustrating and time-consuming. 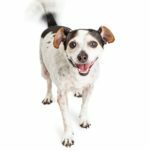 But there are some tricks and tips you can use to help control dog hair in your home. Grooming and healthy diets can reduce shedding. A good vacuum and other cleaning tricks can help you keep your home hair free. 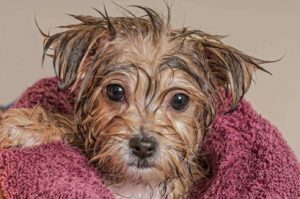 Bathe your dog using a gentle oatmeal dog shampoo. Regular baths help keep your dog’s coat healthy, which prevents excessive shedding. 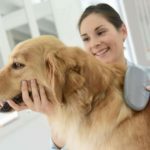 Most dogs benefit from daily brushing, which helps remove loose hair and spreads oil produced by the dog’s skin and helps reduce the risk of dry patches. This helps get rid of dead and loose hair so it doesn’t fly off and land on your floor or furniture. Choose a brush that suits your dog’s coat. For most dogs, a simple wire brush works best. If your dog has longer hair, take care to ensure you break up any tangles without pulling your dog’s coat. Make sure your dog’s diet is high in protein, healthy fats and Omega oils. This helps keep your dog’s skin and coat healthy, which reduces loose hair and shedding. You also can add raw flax seed oil to their food. Before changing your dog’s diet, talk to your vet about the best options for your dog. 1. Upholstery or fabric furniture. Rub a damp rubber glove on furniture. The dog hair will accumulate on the rubber glove. Rinse the glove to remove the hair and repeat until the furniture is clean. You can also use a damp sponge instead of the rubber glove. Upholstery also can be cleaned using a mixture of water and fabric softener. Spray this mixture on the furniture and wipe until it’s clean. Consider investing in furniture covers or throws to protect your furniture from dog hair. 2. Wooden furniture. Use a soft cloth and furniture polish. You can also use anti-static dusting spray instead of furniture polish to remove dog hair. 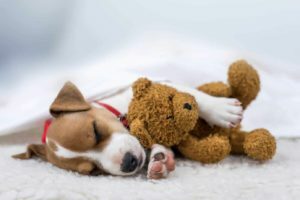 Consider covering bedding with blankets or towels to keep dog hair off your sheets and pillows. If you end up with dog hair on your sheet or pillows, rub a dryer sheet over bedding to remove dog hair. Consider using a scented dryer sheet to remove any dog odors. Do not use these dryer sheets with any other clothing items. 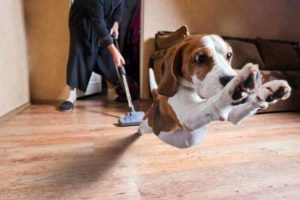 Use an electrostatic or microfiber dust mop to clean dog hair from hardwood floors. Avoid using a vacuum because that will more likely cause the dog hair to fly in the air and cling to other items. Instead use a damp mop to collect the dog hair. To clean the carpet, vacuum it a couple of times in alternating directions. 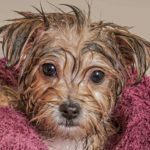 This is important to remove stubborn dog hair. Another alternative is to spray the carpet with water. Use a damp sponge to gently mop the carpet. The hair will clump on carpet and you can easily pick it up. Some people scrape the carpet with a pumice stone to gather the hair from the carpet. To reduce dog hair visibility, consider getting a carpet that matches the color of your dog. You also should consider investing in a vacuum that’s designed to clean up pet hair. Lint rollers are excellent at removing dog hair from clothes. You can also put your clothes in the dryer for at least 10 minutes with a dryer sheet so the hair will wind up in the lint trap. Be sure to clean it often. 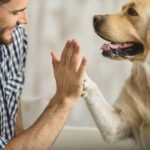 Some health problems led to excessive shedding in dogs. These are Cushing’s disease, fungal infections, allergies, hormonal imbalances and immune disorders. 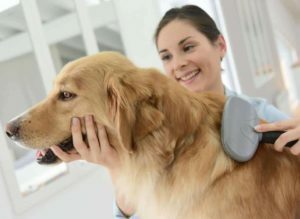 Regular checkups will ensure that your dog is healthy doesn’t suffer from any conditions that produce abnormal shedding. Ella Woods is a stay-at-home- mother and wife who writes in her free time so she won’t go crazy! She shares her experiences on her blog Housinghere.com.